The committee will recommend prohibiting short-term rentals in non-owner occupied single-family homes. City Councilor Jill Duson, the chair of the council’s Housing Committee, listens to public discussion of the issues surrounding short-term home rentals in Portland. The Portland City Council’s Housing Committee came one step closer Wednesday to recommending regulations on short-term rentals like Airbnb, including a prohibition against rentals in non-owner occupied single-family homes. Committee members also approved a 300-unit cap for non-owner occupied units citywide and adjusted a proposed registration fee structure. The regulations still need to be deliberated by the full City Council and may require Planning Board discussion. The city has struggled with how to regulate the rapid growth of properties rented online through companies like Airbnb, VRBO and HomeAway. Property owners offer visitors single rooms, apartments or entire homes for rent. There are more than 650 active listings for places to stay in Portland on Airbnb alone, according to the company. Close to 200 of the rentals are likely rented out full-time, as a business investment, said Tyler Norod, the city’s housing planner. In September, the council committee began crafting rules with the intent of limiting the impact of short-term rentals on the city’s housing stock. Committee members have tried to find a balance between allowing homeowners to help pay bills and taxes by renting their homes part-time and dissuading investors from buying properties and turning them into profitable full-time accommodations. The result has been a complicated multi-tiered fee system and different categories of housing units, differentiating between owner-occupied and non-owner-occupied units and single and multi-family homes. The proposed rules will not affect Portland’s islands, which have a long history of vacation rentals. The committee intends to come up with island-specific rules later. Short-term rental hosts have filled the committee meetings to offer suggestions and testify to the importance of house sharing to their personal finances and the city’s economy. 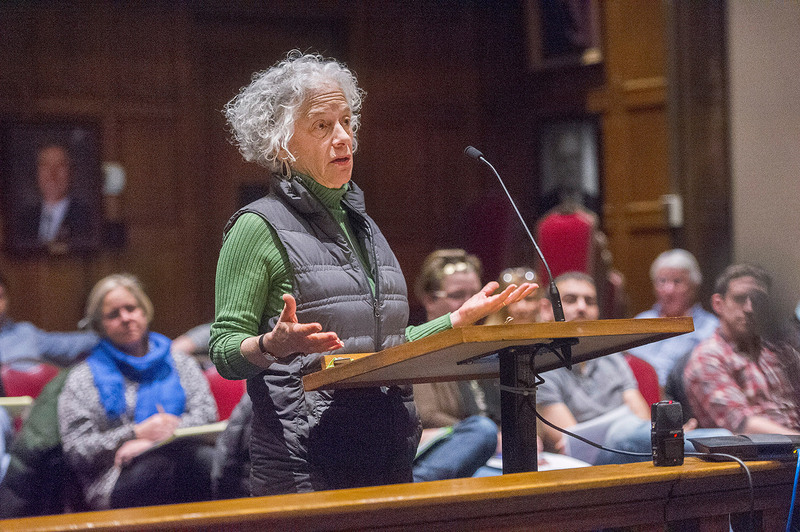 Elizabeth Lantz, who lives on Longfellow Street, speaks against the short-term rentals during Wednesday’s hearing at Portland City Hall. On Wednesday, a group of hosts called Share Portland urged the committee to implement simple rules and require registration so it could determine how many short-term rentals were in Portland before making more complicated rules. Critics also turned out Wednesday and continued to push the committee to make the regulations tougher to limit the impacts on housing in the city and protect neighborhood character. Residents in some areas have complained that the city is not doing enough to stop the spread of investors buying single-family homes to turn them into full-time short-term rentals. Short-term rentals are technically not allowed in Portland’s zoning rules, but the city suspended enforcement in August while the committee came up with regulations. 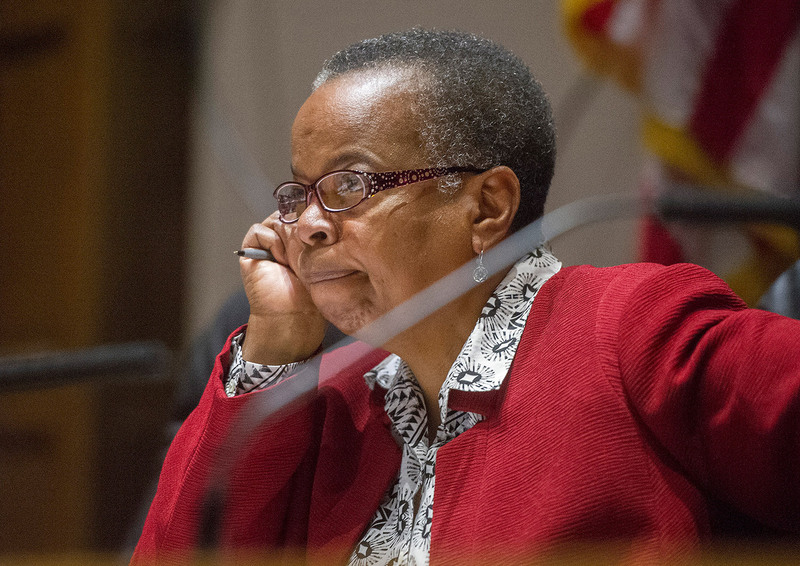 Committee Chairwoman Jill Duson said that prohibiting owners from renting single-family homes they don’t live in would prevent people from “monetizing” the investment others made to create a residential neighborhood. Committee members Brian Batson and David Brennerman both agreed with Duson. 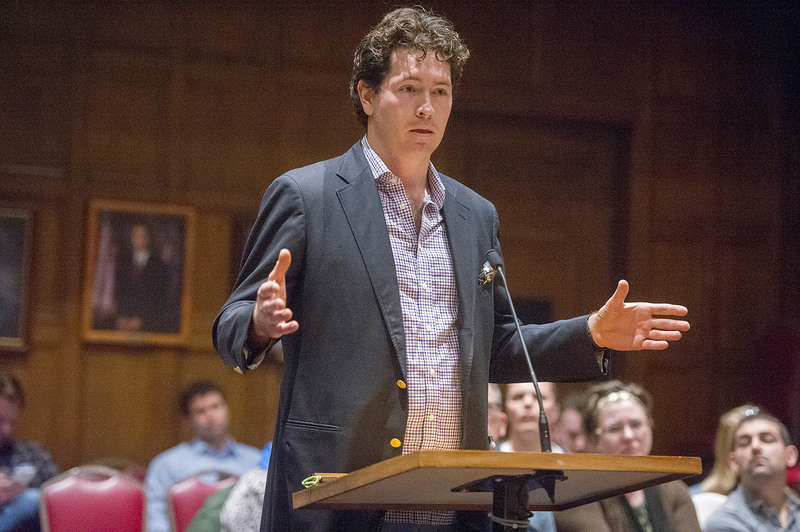 Tobias Glidden addresses the Housing Committee in support of short-term rentals. A tiered fee system developed by the committee had the same intent. Under the tiers, owner-occupied single-family homes would register for $100. Committee members raised the fee from $35, since homeowners can earn at least $80 a night for renting out a room. Owners of multi-family owner-occupied buildings could register the first unit for $100, the second for $200, the third for $500, the fourth for $1,000 and the fifth for $2,000. Fees for units in a non-owner-occupied multi-family building would be double that of an owner-occupied one. The 300-unit cap on non-owner-occupied rentals was based on Norod’s estimate that roughly 200 short-term units are rented full-time. After the limit is met, people will be put on a registration waiting list. The regulation only allows a person to register five short-term units. The rules also outline safety requirements, annual registration and licensing, requirements for property management firms, proof of residency and a registration number. Duson said the proposed regulations could change at the council level and would be reviewed a year after implementation.